With it multitude of towers sticking out against the horizon, San Gimignano is one of the most iconic and recognizable destinations in Tuscany. In every corner of the world, there lives someone with a dream to visit this ancient village and to feel the experience of stepping into a perfect Medieval postcard. A UNESCO World Heritage Site since 1990, San Gimignano, also called the “Manhattan of the Middle Ages,” owes its fame to the incredible quantity of towers that rose above the rooftops of the small town, as many as 65 during the days of the town’s heyday. Thirteen of those splendid towers make up a distinctly unique skyline today. But a visit to San Gimignano is more than just observing what’s up in the air: the Cathedral is a must-see, which was finished in 1148 and is considered to be one of the most illustrious in all of Tuscany. Divided into three naves, the Cathedral is a true anthology of Florentine school frescoes: from Benozzo Gozzoli’s Saint Sebastian to the Stories of Saint Fina by Domenico Ghirlandaio, as well as the Wooden Statues by Jacopo della Quercia. The Town Hall is also interesting, currently home to the Civic Museum and the Pinacoteca, and inside which visitors can admire works by artists like Pinturicchio, Benozzo Gozzoli, Filippino Lippi, Domenico di Michelino and Pier Francesco Fiorentino. 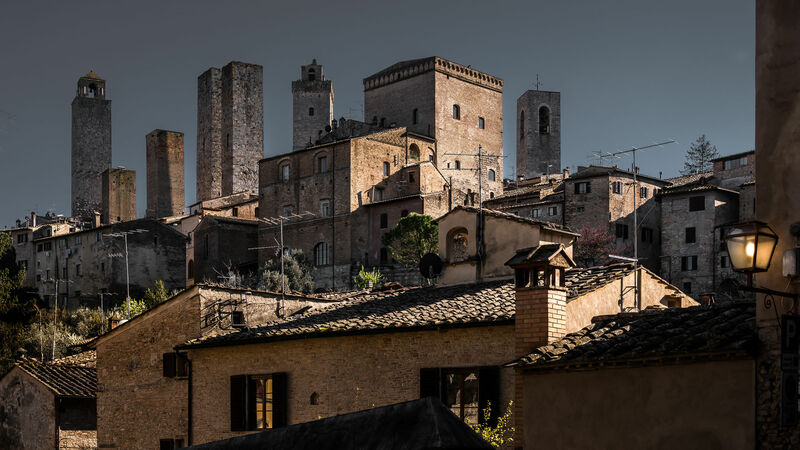 Also inside the Town Hall, visitors can see the Sala di Dante, with Lippo Memmi’s Maestà, and make their way to the Torre del Podestà – or Torre Grossa – which is the tallest tower in San Gimignano at 54 meters, unchanged since its construction in 1311. But the fame of this stunning place in the Sienese countryside is owed to more than just its artistic and architectural beauties. Tasting the Vernaccia di San Gimignano is an absolute must, an exquisite white wine produced only in these hills. It is said that vineyards were introduced to this area for the first time by a certain Vieri de' Bardi around the year 1200. A few decades later, in 1276, commercial trade of the Vernaccia wine was already booming, appearing from that year onward in the Municipality’s “Ordinamenti della Gabella" (Tax Laws). The Vernaccia was the first Tuscan white wine to earn the DOC, Guarantee of Origin (in 1993), and it has been the object of a constant evolution, both in the vineyard and in the cellar. Characteristic elements of the wine are its faint light yellow colour, almost golden, refined smell, dry taste and slightly bitter aftertaste. The alcohol content is 11%, 11.5% for the Reserve. It pairs perfectly with bread and vegetable soups, though fish and shellfish make for the most suitable pairings.